The information age has brought inconceivable amounts of data to every area of life-at home and in the office, for leisure and travel, for shopping and banking. While the Internet provides instant freedom and instantaneous access to hundreds of valuable resources, navigating through the streams of cyber-information can be maddening. Today’s web designers are beginning to understand that it’s not just how good the home page looks, but how quickly and easily information can be displayed, accessed, and delivered. Digital Information Graphics confronts the issues that directly affect our interaction with the screen, whether for the World Wide Web, multimedia programs, or even small-screen devices like mobile phones or PDAs. Filled with tested principles, surefire strategies, and scores of examples and case studies, here are the effective, proven ways to present deep arrays of data for the information age. Readers will discover how to display complex environment and infrastructure in simple, innovative ways; analyze and present data gathered from demographics and news sources; convey complex events and situations in a clear, straightforward manner; and push today’s technology to its limits, resulting in brand-new ways for navigating a website or interacting with the computer. 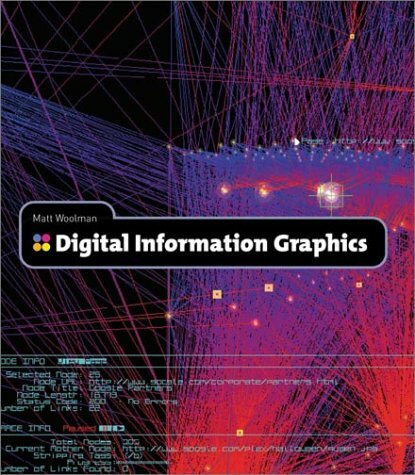 Filled with 500 stunning examples from top information designers from around the world, Digital Information Graphics makes a vital part of design available to everyone living and working in the digital age. Arrived on time in described condition but was not the book I was hoping for. I would have liked this to be be more relevant and timeless in terms of digital graphics core design principals.